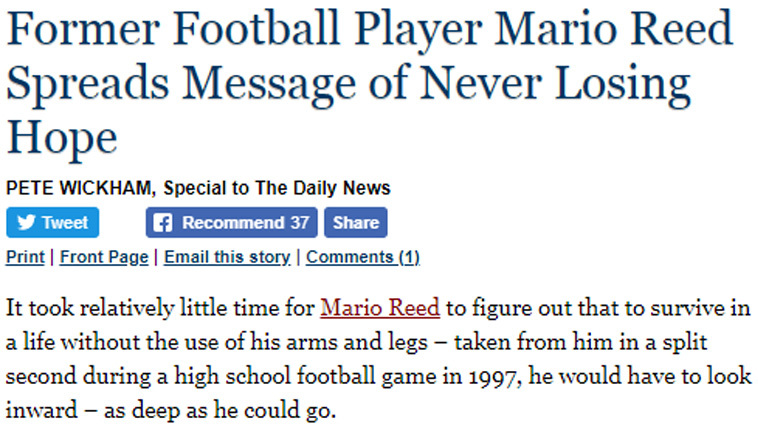 It took relatively little time for Mario Reed to figure out that to survive in a life without the use of his arms and legs – taken from him in a split second during a high school football game in 1997, he would have to look inward – as deep as he could go. For more information, go to theviewwithin.com. Reed was playing football for Millington Central High School when he sustained a spinal cord injury that left him paralyzed and in a wheelchair. 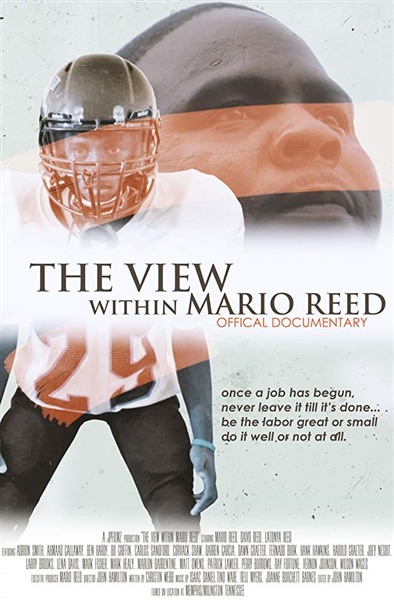 Nearly 21 years after his life-changing injury, Reed will share his life-affirming story on the big screen when the documentary “The View Within Mario Reed” premieres July 10 at Malco’s Studio on the Square theater. It’s quite a view of an inner reservoir that seemingly has no bottom. Harold Graeter, now associate director of the AutoZone Liberty Bowl, was a TV sportscaster in 1997. While in Dallas to cover the Tennessee Oilers, who were playing Thanksgiving Day against the Cowboys, he took a detour to Baylor Medical Center to interview Reed, who was beginning rehab. The interview, Graeter said, was life changing for him. The documentary shows the toil, sweat and pain Reed has gone through for the small victories in his life: The workouts and therapy he goes through almost daily to maintain what little muscle tone he has; the small victories, such as regaining some control of his arms, and some movement in his fingers, thanks to nerve-transfer surgery. The story is about family – mother Winnie, brother David and sister LaTonya – who gave him that first “handhold” after the injury and have led a small army of friends and supporters ever since. “In the hospital I needed a machine to breathe,” Reed said. “I told my family to pull the cord, and they just said, ‘We’re not going to do that. We’re going to take this one day at a time.’ They’re there every day for me. Reed has found that purpose in his workouts. He’s found purpose in victories such as finishing high school, taking college courses, learning to drive a specially equipped van – though its expense forced him to give it up a few years ago. More than anything, he tells his story as often as he can by giving motivational speeches for organizations such as SRVS and the Center for Independent Living. He put his story in book form a few years ago. John Hamilton, who designed the book’s cover, owns a video-production company and put together the documentary along with screenwriter Christin Webb. After its showing in Memphis, he hopes to distribute it to Netflix and organizations like ESPN to spread his message of never losing hope. The movie deals with the memory of a rambunctious, rebellious tough little kid from the wrong side of the tracks, and who that kid has become. Wages was in the stands the night Reed was injured. He’s helped him through issues such as problems with the van, and later trying to get TennCare coverage after he was informed four years ago that the TSSAA’s catastrophic insurance policy – which Reed thought would be for life – was about to run out. The ex-football player who can’t get out of a wheelchair “outran the coverage” by living two decades past the injury. “For years I’ve seen him at football games and we’d shoot the breeze,” Wages said. “One night we were talking about another guy who would come into the weight room when Mario was in there pumping iron. He said he was frustrated at not getting much bigger or stronger, while this guy was born big and strong and everything came easy. But Reed keeps motoring his way through life, and around obstacles. “He said he was going to go to college, and he was going to drive. And doggone if he didn’t do it,” Wages said. “He can sign his name better than I can sign mine. He’s written a book, wrote the screenplay and got the documentary funded. “About five miracles ago I quit rolling my eyes and doubting. When Mario says he’s going to do it, he will,” Wages said.